For my master thesis, I've been working on a project for some time now. In this post I'll share a few debug screenshots of the current state of the project. The project can load triangle meshes of (almost) any format, and convert them to large resolution sparse voxel octrees (SVO). In the picture above, you can see the voxelized Lucy model, which is about 500MB in triangle format. Converted to an SVO, storing only which voxels are on or off, we can store data for up to 4096^3 voxels in only ~40MB. That's a boolean for ~68 billion voxels. But since we only store voxels that are on, this number changes drastically, thus we are able to compress this pretty well. If you want to store more data for every voxel, the amount of memory is going to skyrocket. In the example above, I store a scalar field for every voxel (that's 8 floating point numbers per voxel). All that data nets nearly 870MB for the highest resolution. Where you can see that the voxel resolution is even larger than the millions of triangles stored in the model. The first model at 512^3 resolution, and the second at 2048^3. 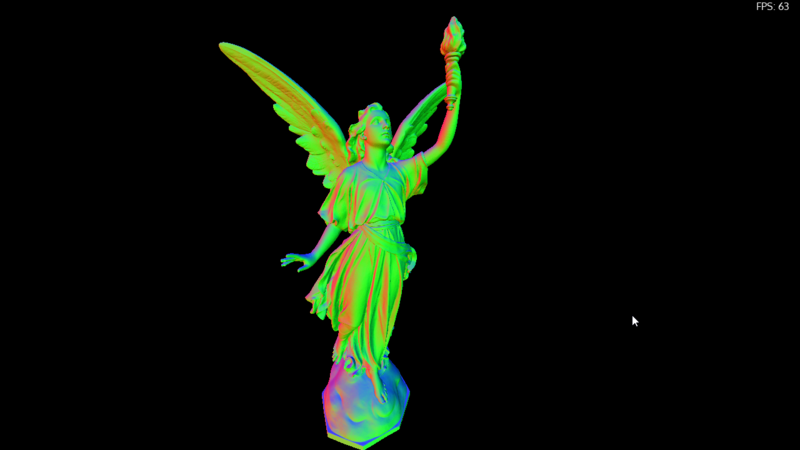 These images are rendered using raymarching to find the intersection point of a ray and a scalar field. I wrote the raytracer in CUDA, which allows for an interactive framerate even with gigantic data sets by using parallelization on the GPU.